The cyber world is abuzz in my neck of the woods, with this hat that everyone is in love with, and I can see why. 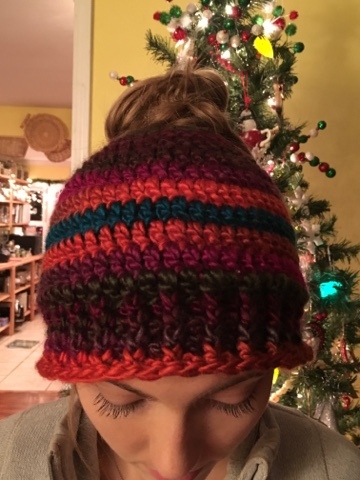 And anyone with enough hair for a ponytail or a messy bun is in for a treat with this hat! 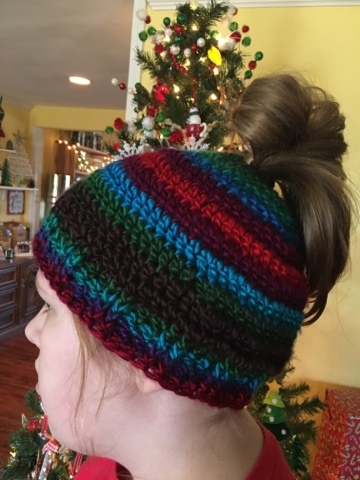 When several of my friends and my sister all inquired to me, asking if I had seen the hat and if I could make it, I knew it was something I needed to try. 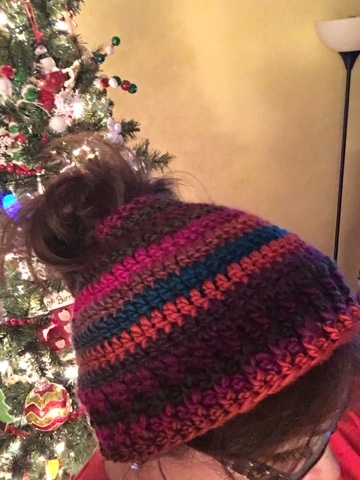 Not having a pattern, nor looking for one, I decided to give it a go myself and I'm going to share my pattern here with you. after row 15, cut length of yarn and weave in ends. 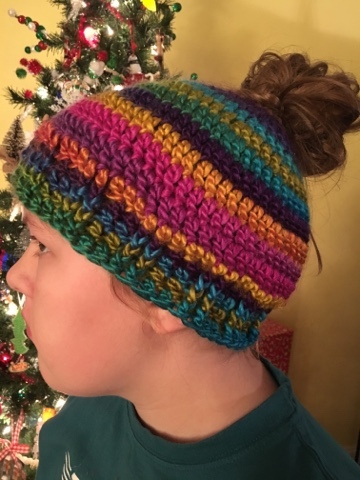 Don't want to make your own or don't know how to crochet? Order one for yourself or someone you love HERE! Please let me know if I can help make this pattern any more clear. I'm happy to help! Yay! I hope you enjoy! Please let me know if there is anything I can do to amend the directions and make it a bit more clear! Blessings!! Love them. 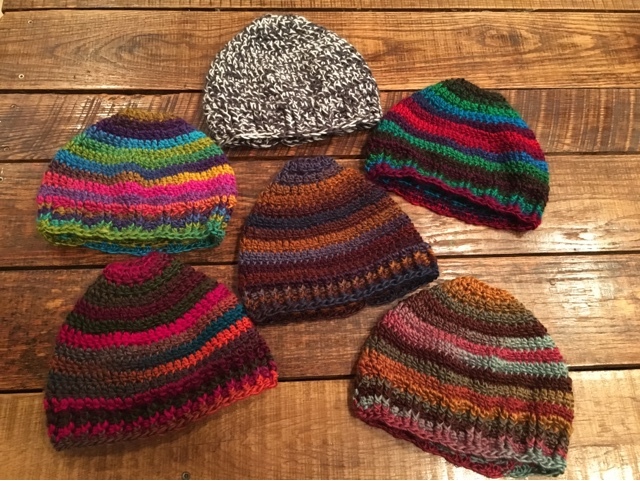 What kind of yarn did you use and what size crochet hook? What do you mean by front double crochet? 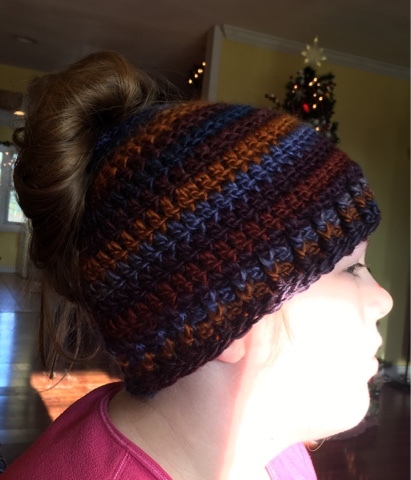 Is it a front post double crochet? Hi Lisa! Yes, that is exactly what I mean. Thanks for asking, I amended the post. What changes , if any, should I make if I use a bulky type yarn? Love this hat. Going to make it for adult granddaughter who works out in the cold at a tire shop. Hi Linda! If I were using a bulkier yarn, I probably would have to be careful to adjust to the size of her head. Because 25 double crochets in this yarn will be much smaller than 25 in a bulky. I'm not certain how to gauge down except to say that I would try it on my head or one of my daughters to make sure it is fitting properly. I hope that helps a little! I'd love to see how it turns out! How much yarn does it take? Will 1 skein be enough? Thanks Much. Hi Frances! It took about one skein of yarn for me. But, I would definitely say that it really depends on the yarn. A smaller/thinner yarn will take more, for sure. How much yard would I need for this hat? 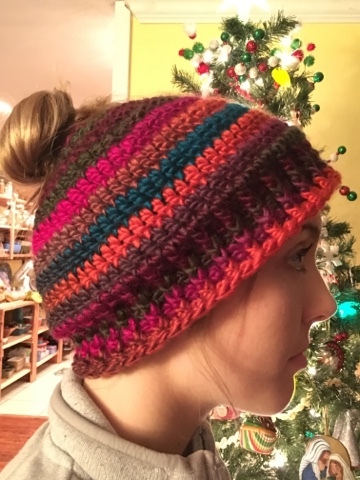 The yarn I used for this is 147 yards long, and it did not take all of it. There was a small remnant over. 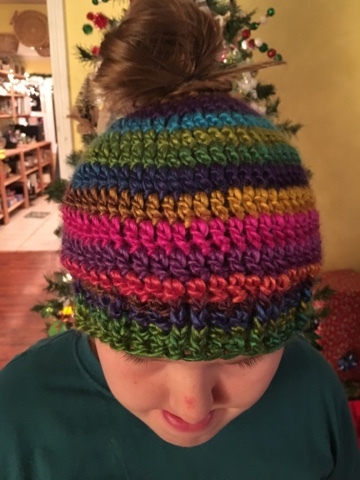 Can you use this pattern using a hair band at the top? Also how would you start using the hair band? Can this pattern be used with a hair band? If so how do I start that?